An intense heat wave in Japan pushed temperatures to 41.1 degrees Celsius (106 degrees Fahrenheit) on Monday in a city northwest of Tokyo, marking a record high for the country, the weather agency said. The high temperature was recorded in the city of Kumagaya, in Saitama prefecture, topping the previous high of 41 in the western prefecture of Kochi in August 2013, according to the Japan Meteorological Agency. 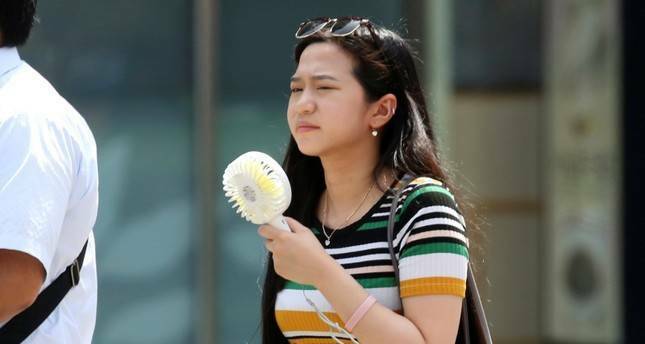 Searing hot temperatures are forecast for wide swaths of Japan and South Korea in a long-running heat wave that's killed at least two dozen people. Hundreds of people have been rushed to Japanese hospitals with heat stroke symptoms in the more than week-long heat wave. Deaths have been reported almost every day. Authorities in Japan warned people to stay inside and use air conditioning.